Orange County Executive Steven M. Neuhaus: Tell Sister City, Hwaseong, South Korea, That We’re Opposed to the Torture and Consumption of Dogs and Cats. Hwaseong became Sister city with Orange County in 2002. In Hwaseong, there are countless dog farms, slaughterhouses, markets and restaurants where the dogs, who are tortured their entire lives, end up being slaughtered in the most inhumane ways, such as by electrocution, hanging or beating; and then thrown into boiling water – sometimes while they are still alive. In many places, dogs are being killed in full view of other terrified, caged dogs; and this takes place in public and in broad daylight. In addition, many abandoned and stolen former pets end up in this industry, and are subjected to the same cruelty. Mr. Chae In-seok, the Mayor of Hwaseong, a city that he describes as South Korea’s “fastest growing” in recent years, signs off his webpage message by saying he wishes “peace and joy”. Mayor Chae also notes that the quality of the city “depends on the degree and satisfaction of the people who live there”, but it is difficult to imagine how these citizens can be at peace knowing that each year countless numbers of dogs and cats are inhumanely raised and brutally slaughtered to feed the greed of those involved in the dog and cat meat trades in and around his joyful city. Mayor Chae also makes 100 pledges, amongst those is 5-6: ‘the creation of eco-farmland’. However, dog farms are insanitary, the dogs are fed on filthy slops, they are frequently pumped full of antibiotics and are slaughtered in illegal and disturbing ways. Mayor Chae, when will you begin acting on pledge 5-6 by ridding your city of the unacceptable, and all round harmful, dog and cat meat trades? 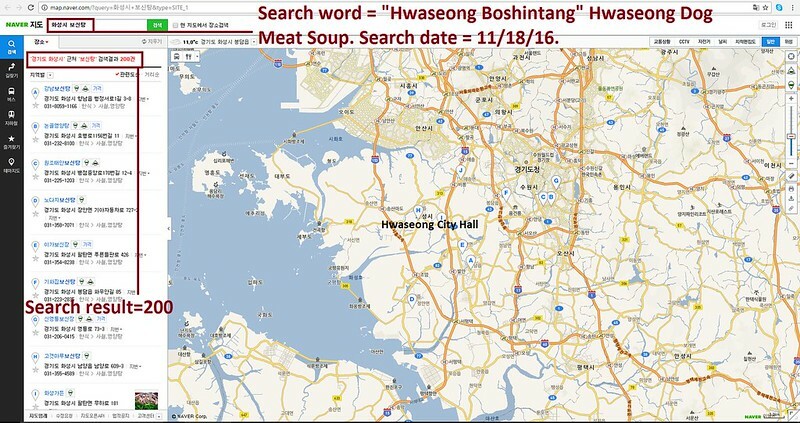 The searches resulted in: 431 Health Food Centers; and 200 restaurants in and around Hwaseong. 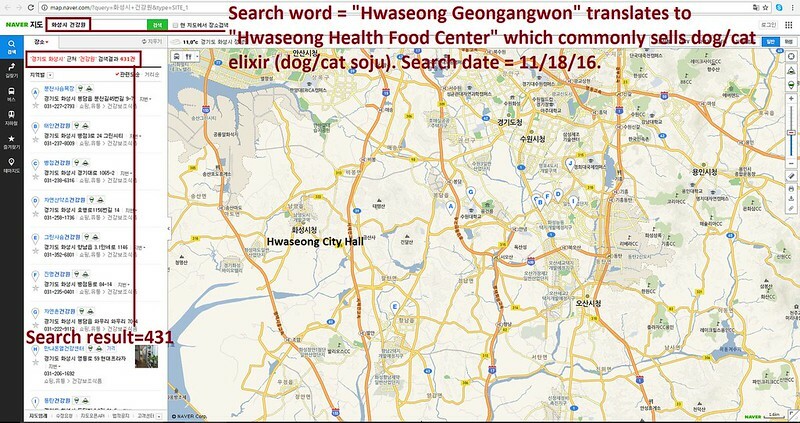 Even if half of these ‘Health’ Food Centers and restaurants serve dog and cat ‘ingredients’ in one form or another, just imagine how many dog/cat slaughterhouses must be present in and around Hwaseong in order to supply all of these outlets. Orange County Executive Steven M. Neuhaus TODAY! Call the County Executive Office! Hello, I’m calling to speak to someone in the Mayor’s Office to ask for their help on an important issue regarding your sister city, Hwaseong in South Korea. So, I am asking you to please speak with your counterparts in Hwaseong to urge them to enforce their own laws, not ignore them, and to show compassion to their companion animals, and also respect to their own citizens, by bringing these trades to an end. No matter where you live PLEASE SHARE these actions with your friends – especially those who live in Orange County! This is horrific , putting these dogs and cats through this please stop !